We offer state-of-the-art LED light therapy to protect, heal, and preserve skin’s beauty and health. Dr. Eugenie Brunner, our board-certified facial plastic surgeon, uses Omnilux LED light therapy as a standalone treatment as well as a complementary method following injection, laser treatment, or surgery. Omnilux is FDA-approved and offers a wide range of benefits that can be tailored to suit your individual needs and goals with minimal downtime. Omnilux is an innovative technological platform that uses singular wavelengths of LED light to achieve different cosmetic and medical effects. 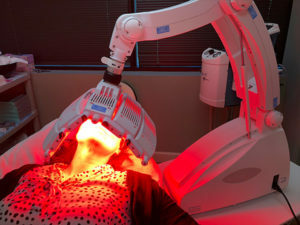 Depending on the type of light used—red, yellow (infrared), or blue—patients can address concerns from wound healing to acne with excellent results. LED light therapy is non-thermal, meaning it does not use heat to achieve the desired outcome. Instead, focused, powerful dosages of light are delivered into the specified area for the optimal result. And the intensity of each light wavelength (Blue – 415nm wavelength; Red – 633nm wavelength; Yellow – 830nm wavelength) is fully customizable. What Concerns Can Omnilux Light Therapy Treat? One of the many benefits of Omnilux treatment is the wide range of issues that can be treated or minimized with light therapy. Each of the three wavelengths available allows for unique purposes, and Dr. Brunner can help you determine which type of light is right for you. In some cases, a combination of wavelengths may provide the ideal approach. 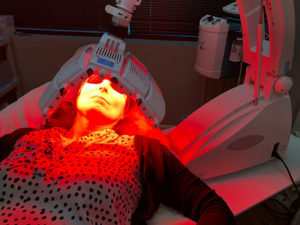 Red light (633nm wavelength) is used primarily for skin rejuvenation. Omnilux revive² offers improvement of fine lines and creases, mild acne, hyperpigmentation, rosacea, and certain non-melanoma skin cancers. With regular treatment, this method can stimulate cell turnover and collagen formation, leading to brighter, healthier, and more youthful-looking skin over time. Omnilux revive² is also used in conjunction with other treatments for more comprehensive benefits and improved healing, and we often recommend this technique following micro-needling, microdermabrasion, and surgery to enhance the recovery process. This blue light therapy (415nm wavelength) is particularly well-suited to reducing the appearance of acne vulgaris blemishes. The light destroys the bacteria associated with breakouts for smoother, healthier-looking skin. Omnilux blue can also be used to treat actinic keratosis when combined with Levulan (also known as photodynamic therapy), a common concern that can develop into skin cancer. When combined with Omnilux revive², Omnilux blue can address moderate acne and actinic keratosis. During your initial consultation, Dr. Brunner will discuss the optimal technique for your needs and goals. Omnilux plus™ uses a yellow or infrared light (830nm wavelength) to address sun damage and to enhance youthfulness through cell turnover, elastin and collagen production, and especially wound healing. The infrared light is designed to aid in reparative therapy, which is ideal after other cosmetic treatments as well as for more general improvement of facial skin. These LED light treatments can be added to virtually any procedure, from chemical peels to cosmetic injectables, laser facials to laser resurfacing, and even following facial cosmetic surgery. Our extensively trained medical team will be happy to go over how Omnilux can enhance your treatment plan at your first visit. How Long is Recovery Following Omnilux Treatment? Usually patients experience minimal or no downtime following Omnilux therapy. That said, other treatments that are used in conjunction with Omnilux may require some recovery. We will review what to expect during your consultation process so that you are fully prepared. Since Omnilux does not use heat as part of the therapeutic effect, you should experience little to no discomfort or side effects. How Much Does Omnilux LED Light Therapy Cost? The price of Omnilux will depend on the number of sessions you need to achieve your goals, the particulars of your treatment plan, and whether you are using a combination of LED wavelengths or a single one. Many people benefit from having multiple sessions, and we will go over the number of treatments that will optimize your outcome. For more information, simply ask any of our staff. Would you like to find out how Omnilux LED light therapy can help you achieve your goals or recover from a procedure faster? Contact our practice today to schedule a consultation with Dr. Brunner.